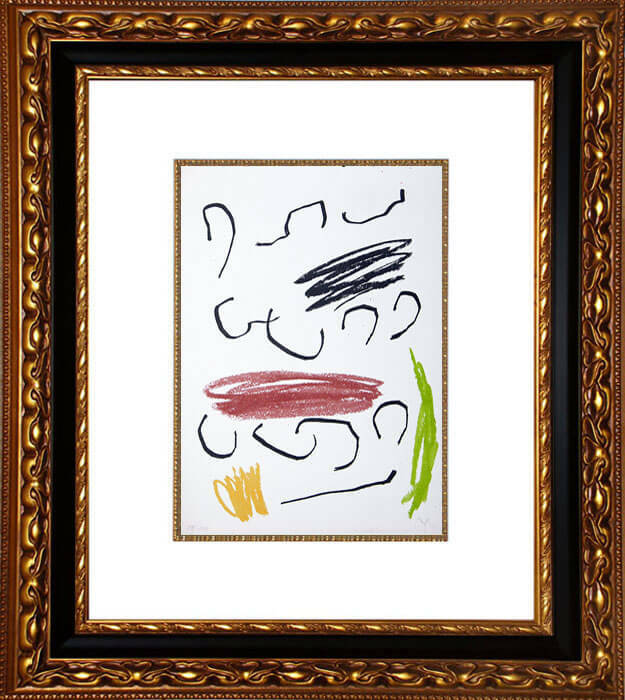 This work is initialed 'M' by Joan Miró (Barcelona, 1893 - Palma, 1983) in pencil in the lower right. 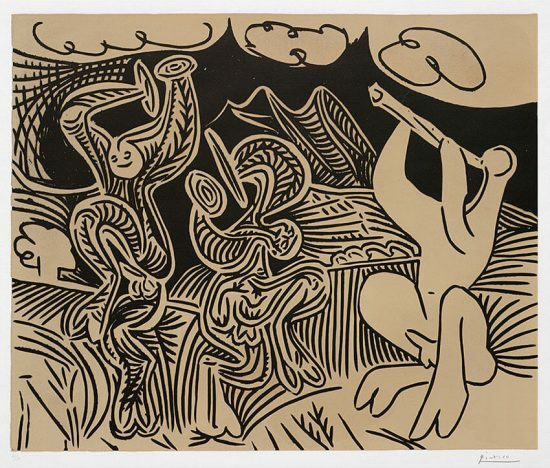 Flitting horizontally across the piece, delicate black lines twist and turn. 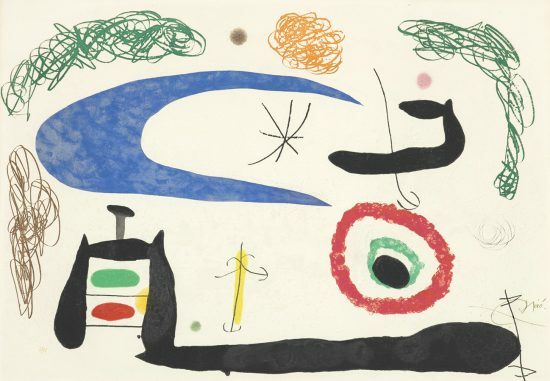 Joan Miró Lithograph VII from Miró, Obra Inedita Recent, 1964 utilizes a subdued color palette of softened greens, yellows, and browns to highlight the exquisite pattern of these swirling black forms. 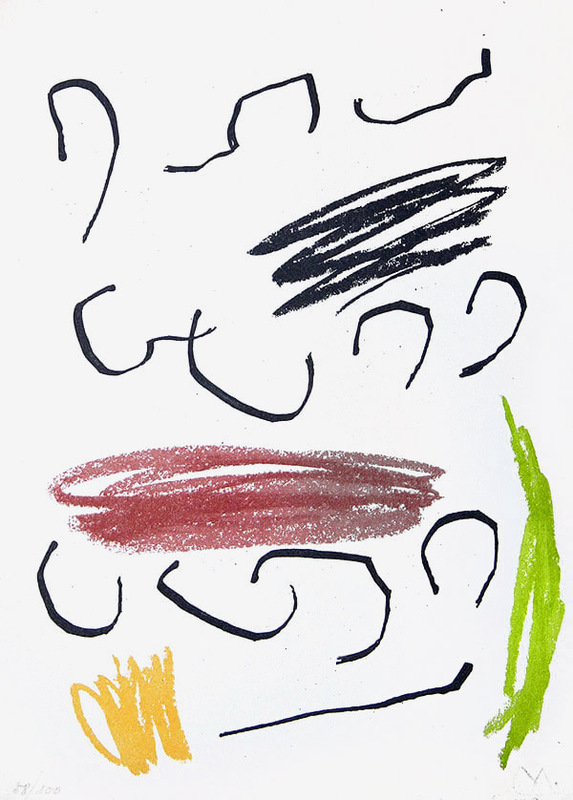 Despite the somewhat topsy-turvy nature of the piece, the forms retain a sense of order and balance as they line up horizontally across the page and gently guide the viewer's eye across the surface, highlighted with patches of color. 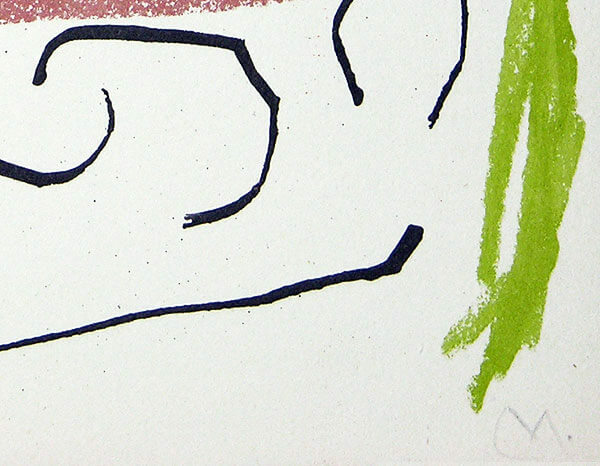 Created in 1964, this color lithograph is published by Sala Gaspar, Barcelona and printed on Guarro paper. 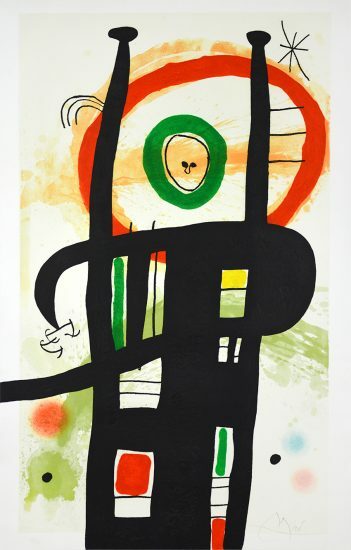 From a series of eleven color lithographs used in the book Miró, Obra Inedita Recent. Initialed 'M' by Joan Miró (Barcelona, 1893 - Palma, 1983) in the lower right in pencil, this work is numbered 58/100 in pencil in the lower left on Guarro paper. 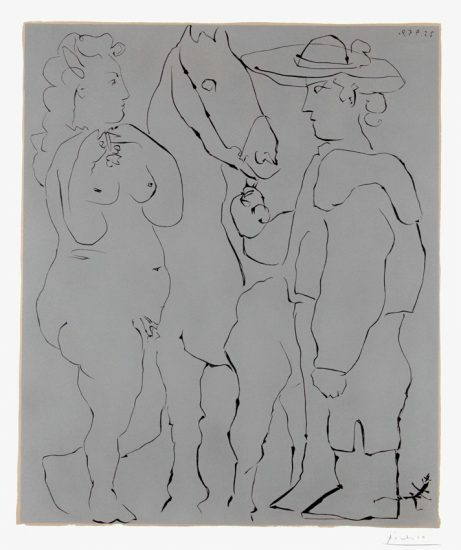 Texts by Joan Brossa, A.Cirici and E. Cirlot. This book was originally published as a catalogue for the Miró exhibitions at the Sala Gaspar, Galeria Metras, and Belarte of Barcelona, 1964. 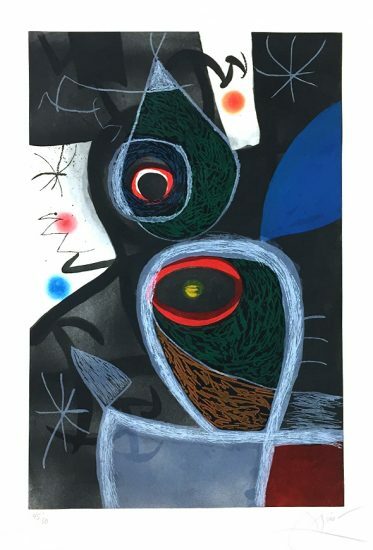 Joan Miró Lithograph VII from Miró, Obra Inedita Recent, 1964 is fully documented and referenced in the below catalogue raisonnés and texts (copies will be enclosed as added documentation with the invoices that will accompany the sale of the work). 1. 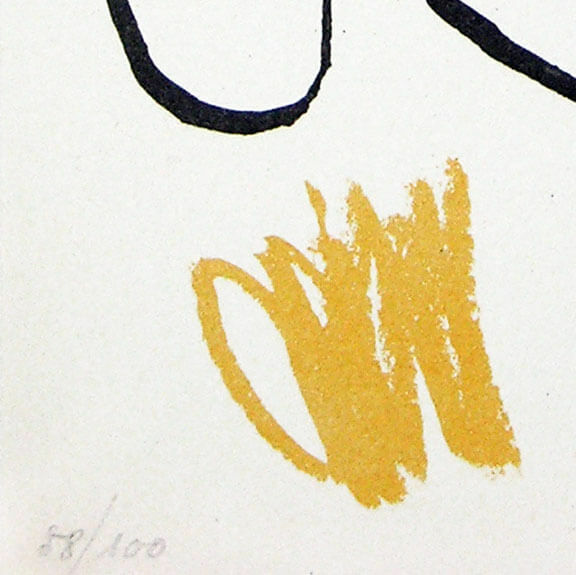 Maeght Éditeur, Joan Miró Lithographe Vol. III 1964-1969. Listed and illustrated as catalogue raisonné no. 424 on pg. 66. 2. 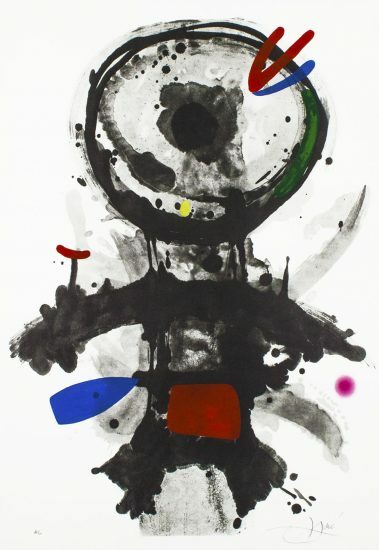 Cramer, Patrick, Joan Miró, The Illustrated Books: Catalogue Raisonné, 1989. Listed and illustrated as catalogue raisonné no. 95 on pgs. 252 and 253. 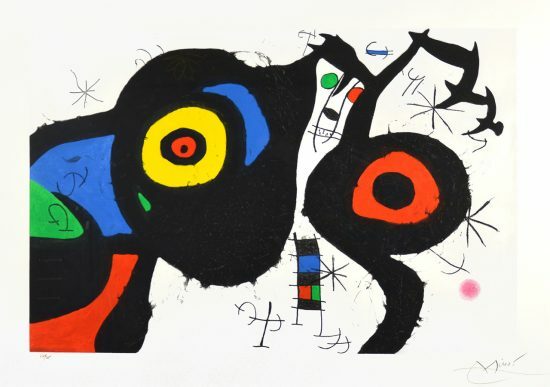 Joan Miró Lithograph VII from Miró, Obra Inedita Recent, 1964 is framed to museum-grade, conservation standards, presented in a complementary moulding and finished with linen-wrapped mats and optical grade Plexiglas.